Immediate Availability – On the ground ready for delivery or pick up. 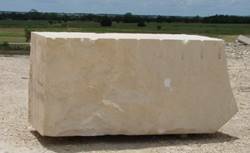 We can supply a large number of different Grade Blocks for “Cordova” Cream and Shell Limestone. #1 Block – Consistent density with fewer inclusions. This grade is best when producing architectural and dimensional features. #2 Block – Consistent density with minimal dries and inclusions. #3 Block – Less consistent density with dries, pockets of mud and larger inclusions. This material works well for sawn and chopped building material. 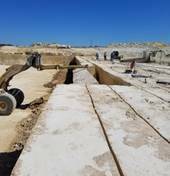 Continental Cream Quarries is the trusted supplier of blocks and slabs to cut stone fabricators around the country. In 2009, the “Armadillo” quarry was re-opened and continues to produce “Cordova” Cream and “Cordova” Shell Limestone. “When Texas Was at the Bottom of the Sea”, a Smithsonian.com article dated January 2015, describes the writer’s experience. Olivia Judson studied the rock she sat on while visiting the Guadalupe Mountain range. 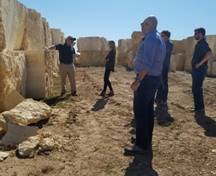 She was in awe of the life forms that were created from the reef approximately 265 million years ago that are now permanently preserved in our “Cordova” Cream and Shell Limestone. Today, we quarry from what used to be the depths of the bottom of the sea. The “Cordova” Cream and Shell Limestone are known for consistency, quality and warmth in natural color, and is the premiere choice for cut to size architectural elements. Both have been used as building material for over 100 years. Below are examples of tiger striping and inclusions. All are part of nature’s creation. Range samples can be provided to demonstrate the range in color and texture.